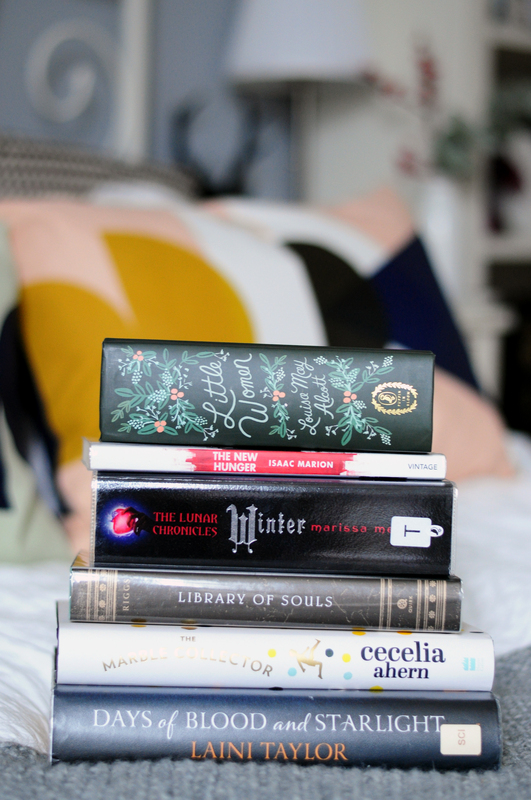 Little Women | The New Hunger | Winter | Library Of Souls | The Marble Collector | Days Of Blood And Starlight. For the third year running, I am taking part in the Goodreads Reading Challenge. Again, I hope to read one hundred and four books this year which works out to two a week. A read a lot and while it might seem like a huge number of books, I've managed to complete both 2014 and 2015 challenges plus a few extras. I know I'll be able to complete it although I haven't got off to a very good start as I am already two books behind schedule. The Rifle Paper Co version of Little Women has been on my wishlist for such a long time and I finally bought it when I bought a couple of things from the Anthropology sale. The cover is gorgeous and I hope to buy the other books as well. The New Hunger is the prequel to Warm Bodies, a favourite of mine I read in 2013. It's only 170 pages so will be a quick read and then I want to read the second book in the series, The Burning World. Being alive is hard. Being human is harder. Peregrine's Home For Peculiar Children into a film. I've nearly finished the second book in the Daughter Of Smoke & Bone series by Laini Taylor. This has been what I call my bath book as it's too heavy to take to work with me so instead I read it when I want a long soak and have a pamper bath. Loved the Laini Taylor series. Enjoy the second book :) It's magical!